Image caption Was it just another scam? 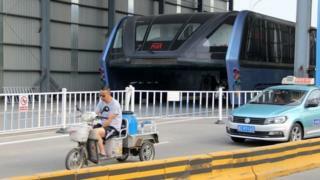 Police in Beijing have arrested 32 people for illegal fundraising linked to a scrapped project to create a "straddling bus" to beat traffic jams. The futuristic idea to lift commuters above congestion quickly attracted international attention when it was launched last year - but was finally scrapped last month. There had been growing speculation that it was no more than an investment scam. In a statement, police said they were working to recover investors' assets. China has seen a series of scams where online platforms offer big returns on money invested into start-ups, an area mostly ignored by the country's state-run banks. Among those arrested was Bai Zhiming, the 47-year-old CEO of the Transit Elevated Bus Company (TEB) who is also the founder of peer-to-peer financing company Huaying Kailai Asset Management. The other 31 were Huaying Kailai employees. Investors had reportedly been offered returns of 12% if they put money into the project, but allegations in the Chinese media had said it had been a way of luring them into buying financial products. Doubts about the bus - a 22m-long electric vehicle standing nearly 5m high and 8m wide - began to emerge when all tests were halted shortly after the first test run. Many doubted the vehicle would be able to manage curves or fit under footbridges and critics asked how it would turn corners, whether it was strong enough to bear its own and passengers' weight and how long its battery would last. Others noticed that the model used in the test run was the same as the one presented when the idea was first floated in 2010, suggesting no technical progress had been made. There was also confusion about whether the bus had been approved by the authorities - but the Financial Times newspaper reported that the government of Qinhuangdao in Hebei province, where the TEB was based, had said it would invest $1.5bn (£1.2bn) in the project. Last month Chinese media reported that the Qinhuangdao test site had been demolished.